An updated Goodwood Road concept design and a summary of recent public community engagement was presented to elected members last night. The briefing allowed us to review the feedback we have received from the community. It allowed us to provide to the project team our own feedback before moving to preparing detail design and documentation. 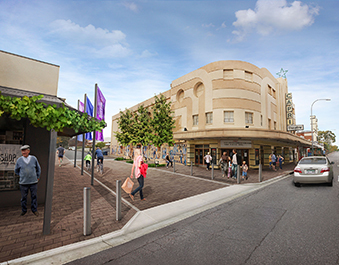 The community consistently identified the following aims, opportunities and expectations of the future streetscape of Goodwood Road. New paving that opens up the street and improves accessibility. Expanding opportunities for community interaction, including more social settings, safer crossing points, improved access to shop-fronts, new art and event actuation. De-cluttering the street and providing a distinctive suite of street furniture, consolidated in key locations and suited to all ages. Desire for lighting to be reflective of the precinct, including feature lighting, heritage facades, verandah lighting and public art integration. More shade and opportunities for greening along the street, including street planting, planting beds, vines and pots. Safer side streets that improve pedestrian accessibility and slow local speeds, whilst maintaining existing vehicle access and local servicing requirements. With the contribution from the elected members the project team will now prepare a consultants brief for the detailed design and documentation of the agreed concept design for Goodwood Road, leading to construction commencing early/mid 2016. The ongoing engagement since the original 2009 Urban Design Framework has ensured that we will have a design that works best for all. I am quite impressed with the work done. Recognising that designs can alter once detailed work is undertaken but the concepts will see Goodwood Road transformed. So Unley’s best kept secret wont be for much longer. In September the under grounding of the power lines should commence and continue until early to mid march of next year. This work will recess for the Christmas trading period. Once this work is complete the streetscape upgrade works can commence. Oh Mr Hart! The Subway Project still alive and well. The Community wants it.